During his visit to INNOPROM-2017, Russian President Vladimir Putin mentioned that he drove a Nissan car for several years while working in St. Petersburg City Hall in the 1990s. Sputnik runs through the other cars the head of state has used through the years. On Monday, Russian President Vladimir Putin arrived for a two-day visit to Yekaterinburg to take part in the opening of INNOPROM-2017, an annual international industrial trade fair held on July 10-13. The Russian President explored projects and products presented at the fair, including Japan's Nissan that showcased their new 2017 Murano crossover. "In the 1990s, when I worked in the St. Petersburg mayor's office, for several years, I drove a Nissan. 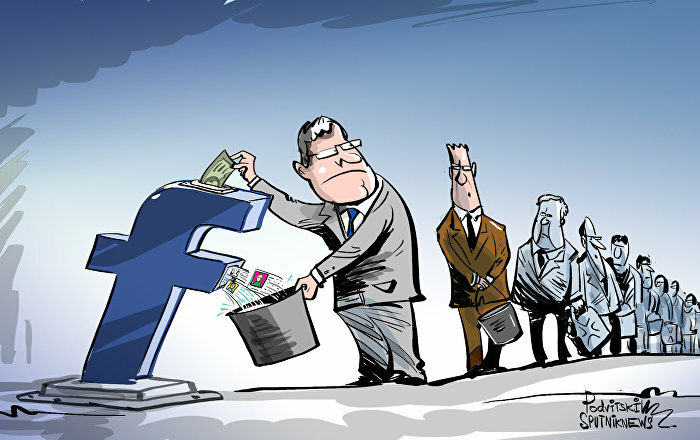 It was not that complicated, of course, but I really liked it," Putin admitted. Presidents George Bush of the United States and Vladimir Putin (left to right) of Russia before the informal dinner. July 14, 2006. A 1972 ZAZ Zaporozhets was Putin's very first car. The Soviet supermini manufactured by Zaporizhia Automobile Building Plant was a prize that Putin's mother won in a lottery when he was a third-year student at the Leningrad State University. His parents decided to ‘treat' their son and gave the Zaporozhets to Vladimir, who was racing the car literally everywhere, as he revealed in his 2000 memoir "First Person: An Astonishingly Frank Self-Portrait by Russia's President Vladimir Putin." In 2005, when George W. Bush was on his presidential trip to Europe, he met with Putin in Novo-Ogarevo, the Russian presidential country residence in the Moscow environs. Then, Putin offered his guest a ride on his vintage GAZ-21. Bush drove a couple of circles around the residence. Presidents Vladimir Putin of Russia, right, and George W. Bush of the USA meet in Novo-Ogarevo, presidential country residence in the Moscow environs. May 8, 2005. "He's giving me a driving lesson," the US President joked to reporters. The ivory limo with the GAZ cars' distinctive leaping deer hood ornament is Putin's personal car. It was restored at the Gorky Automobile Factory where it was produced in 1956. During the refurbishment, the car received a leather car interior of a matching color, an automatic transmission and chrome-plated alloy wheels. 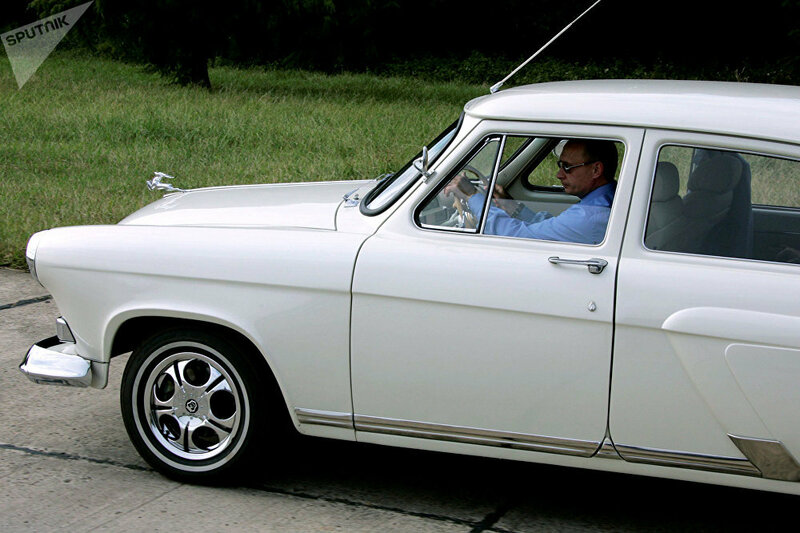 V. Putin driving a GAZ-21 "Volga"
National transport services for the Russian President are provided by the Special Purpose Garage, a unit within the Federal Protective Service. 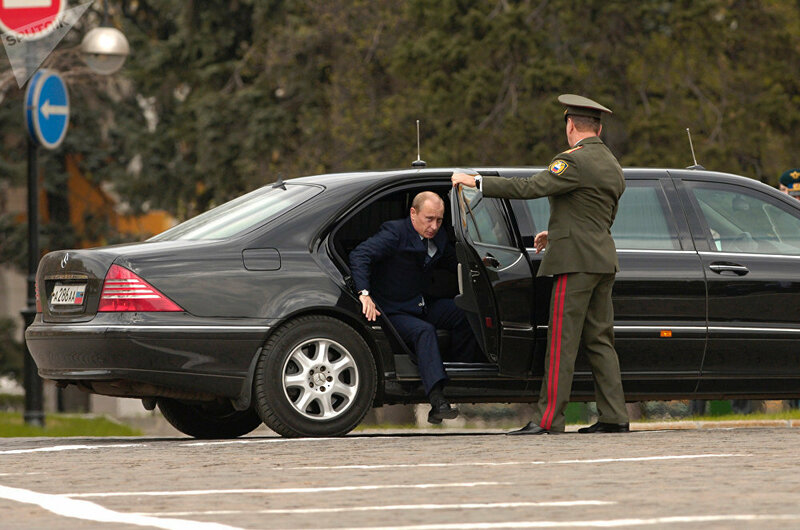 The main official state car of the Russian President is an armored limousine Mercedes-Benz S600 Guard Pullman. This 6.2-meter-long car meets all the safety requirements for vehicles of this designation. However, Putin mostly uses this vehicle as a passenger. In 2009, Putin showed his new Niva SUV to the press, before holding talks with the-then Turkish Prime Minister Recep Tayyip Erdogan. He even suggested reporters to test the three-door camouflage-colored car personally. One of the journalists sat behind the wheel, and photographers immediately surrounded the car. Putin warned reporters: "You'd better step aside, guys. It's a serious car." The Russian Prime Minister, Putin went on a trip in August 2010 and drove more than 2,000 kilometers along the Chita-Khabarovsk highway in a bright yellow Lada Kalina Sport. He liked the car. Prime Minister Vladimir Putin and a Lada Kalina. August 27, 2010. "The car looks like a chicken but flies like a swallow," Putin noted. After a long drive, he autographed the car and donated it to the AvtoVAZ museum. In April 2011, Russian Prime Minister Vladimir Putin conducted a test drive of Russia's new Yo-Mobile hybrid car on the ten-kilometer route from his residence to President Medvedev's country house outside Moscow. Yo-Mobile was a project by Russia's Yo-Auto, a joint venture between truck maker Yarovit and billionaire Mikhail Prokhorov's Onexim group. Putin was shown two modifications of the prototype, which never went into mass production: a beige-chestnut microvan and an azure-white cross-coupe. Later that year, in May, Putin visited the Russian city of Togliatti, where he had an opportunity to check out the latest car from the AvtoVAZ plant — Lada Granta. Putin was given a mini-presentation of the vehicle. To start off, he walked around to the back of the Lada Granta and asked to open the boot. But, unfortunately, it got stuck. Several seconds later, though, AvtoVAZ Director Igor Komarov and Rostekhonologii head Sergey Chemezov managed to pry it open by force. Russian Prime Minister Vladimir Putin, left, takes the Lada Kalina model-based new Lada-Granta car for a drive at AvtoVAZ plant in Togliatti. May 11, 2011. After that Putin took the keys and hopped into the driver's seat. But he didn't manage to start the engine in one go. Later, he explained that he simply did not know the car was fitted with a modern electronic e-gas system. The-then Prime Minister took the car on a test drive along the experimental track and then drove the car to a meeting with AvtoVAZ employees. 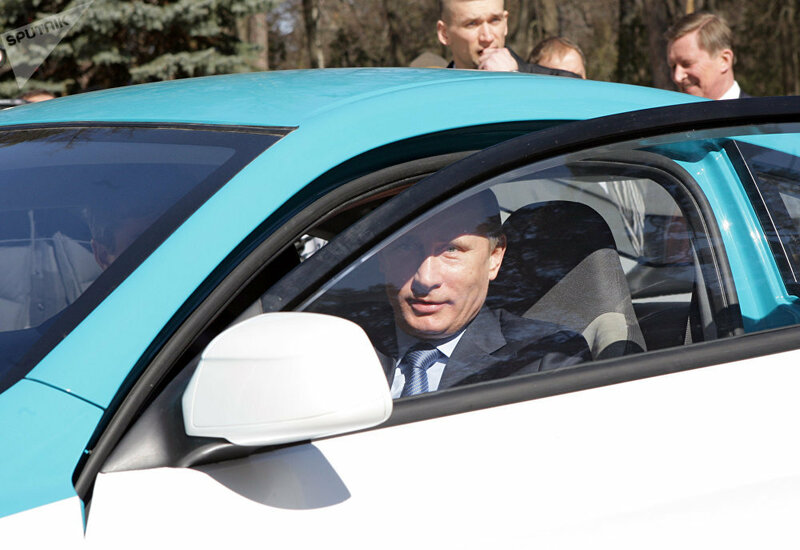 Talking about his impressions of the car, Putin stressed that he was satisfied with it. "You've made a good car. It's good for traveling to the dacha [country house]," Putin said. 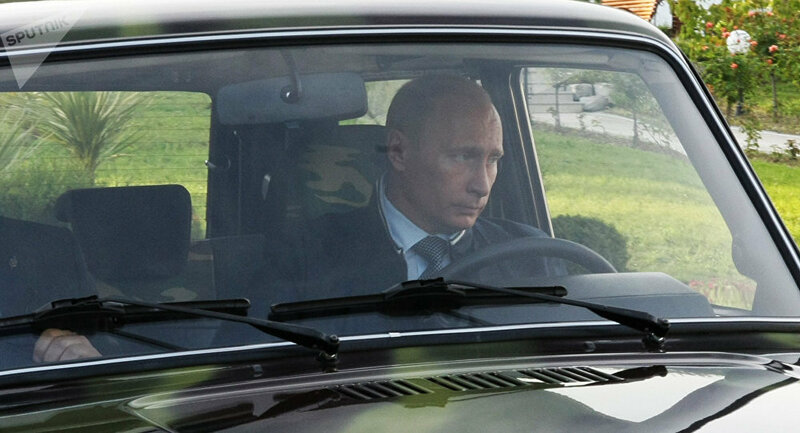 On his way to a session of the Valdai International Discussion Club in Sochi in October 2015, Russian President Vladimir Putin tested a brand new Russian car — he arrived at the venue in an AvtoVAZ Lada Vesta of a lime green color. 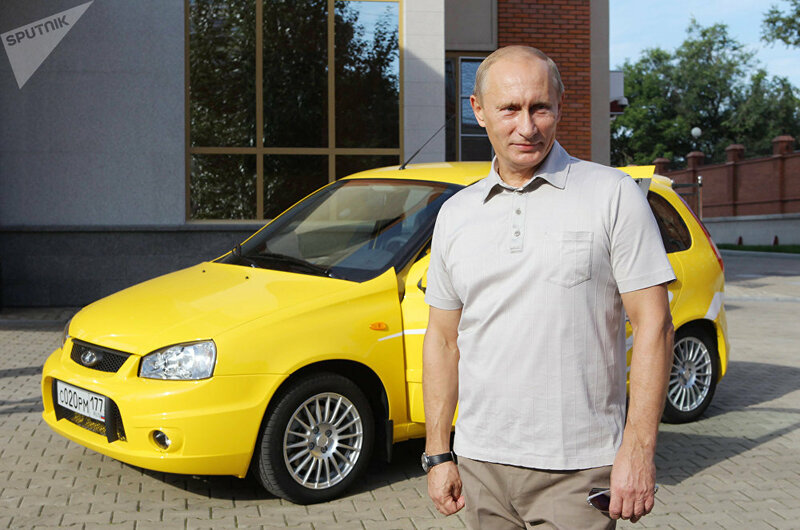 Putin was pleased with the new model and gave the car his presidential approval. October 22, 2015. President Vladimir Putin (front) drove Lada Vesta, a new AVTOVAZ car, to the plenary session of the 12th annual meeting of the Valdai International Discussion Club in Krasnaya Polyana. Back: Bo Inge Andersson, President, AVTOVAZ. "A very good car, a very good throttle response and it handles easily," Vladimir Putin said of the vehicle. "There are winding roads [in Sochi] and you are permitted to drive 30-50 km per hour, but I'll tell you in confidence that we drove a little bit faster," he confessed. "They [AvtoVAZ] are already planning car sales in those regions of the world and those countries which already know Lada: Eastern Europe, the Middle East, and Latin America, and I think the sales will go well," the president added.